I have a piece of Chinese porcelain with "Made in China" painted or stamped in red on the bottom. Could you tell me more about how old this piece could be? As usual there is a great confusion about marks also on later Chinese porcelain, since the rule in China still is to put whatever mark they belive will add to the value on anything. As a general rule the plain "CHINA" mark came into use after 1891 when US federal law required all imports to be marked with their country of origin. 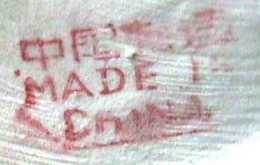 The addition of "MADE IN" was required from 1919. The "PEOPLES REPUBLIC OF" or its abbreviation P.R.O.C. in Western or Chinese characters was added from 1949. The general appearance of the piece must always be taken into the consideration but these dates might help as a starting point to put a "not before, anyway" date on the pieces. For further information on this, please see my special section on MARKS or make a general search for individual items plus the word "mark".